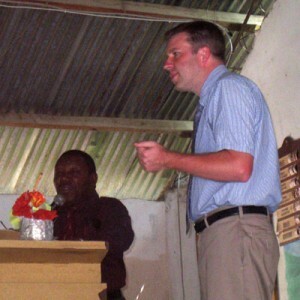 Pastor Diogene (left) translating as Philip teaches. We wrapped up a two-day conference for lay leaders this afternoon. Approximately 200 Haitians from the surrounding area attended, some walking several hours to be here. I taught five sessions through the book of Philippians, addressing topics including the truth of God’s Word as the foundation for all ministry (Phil. 1:9), the importance of humility in leadership (Phil. 2:1-11), and the examples of Paul, Timothy, and Epaphroditus in various ministry positions (Phil. 2:17-29). We completed the conference with a question and answer time, and I was impressed and blessed by the quality of their questions. Their sincerity was evident, and I enjoyed discussing real ministry issues with them and exploring biblical answers to the challenges they faced. Dieu-Mene rounding the handle on his newly built tool box. 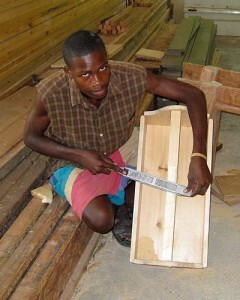 Dieu-Mene is one of our older orphanage children who wants to become a carpenter. To encourage him and allow him to begin to develop skills in this area, Bernie brought several hand tools this trip to give to Dieu-Mene. Bernie also suggested Dieu-Mene’s first project, a wooden toolbox, and provided the wood along with a basic plan. Dieu-Mene got to work, cutting the rounded lines with his new coping saw, smoothing the edges with his Surform plane, and assembling the pieces with nails and glue. Bernie periodically left the ministry accounting work he was doing to check on Dieu-Mene and offer advice and demonstrate techniques. In the end, Dieu-Mene produced a very nice, solid, and function toolbox in which to keep his new tools. And he was very pleased with it. After spending the first few days of our trip at the Pastors’ Conference in Gonave Bay, Bernie, Dave, and I arrived at Tricotte Wednesday afternoon. As always it was a joy to be reunited with the orphanage children and many other dear friends in the village. This morning (Thursday) we traveled to the village of Morne Chaise. 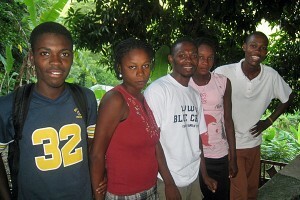 Morne Chaise became the home of the 33rd Starfish Ministries School in the fall of 2009. There are 53 children enrolled at the school, which is still held in a small post-and-palm-frond building. Our goal is to build a more suitable and permanent structure eventually. 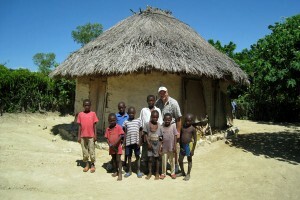 Dave Morley along with seven of the Morne Chaise students, in front of the home one of these boys along with nine other members of his family. Even though school is not in session, we were able to interact with several of the students and visit a couple of their homes. They live in stick-and-mud huts that often shared by extended families, but they are grateful for all that God provides, including the education and feeding program that is made possible through your support. You can enlarge the photos by clicking on them. Thank you for your prayers! 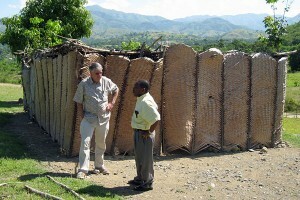 Bernie, David Morley, and I arrived safely and without any complications in Haiti on Monday morning. And after a couple of brief stops in Port-au-Prince, drove two hours north to Gonave Bay for the Pastors’ Conference that Starfish Ministries sponsors each year. As I shared last month, this year’s topic is “Developing Effective Leaders” within the church. I’ve taught two sessions so far, and I’m encouraged by the response as I’ve interacted with many of the pastors, listening to accounts of their victories and challenges in this area and seeking to answer their questions based on the truth of Scripture. Now, on Tuesday afternoon, the pastors are enjoying some personal time relaxing and reflecting, Dad and David have gone to Bethel to meet with two young Haitian men who are doing some work for Starfish, and I have stayed back to write this letter to you.